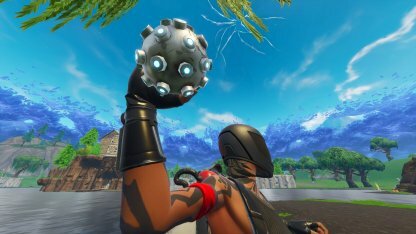 Find out about the damage, rarity, & effects of Grenades and others in the Throwable weapon class in Fortnite! Each Throwable weapon is unique to other Throwables. Some may damage the enemy, while others have non-damaging effects. For example, a Boogie Bomb will make everyone in an area dance. Throwable Weapons affect an area when they explode. You will be able to hit multiple enemies, but be careful! Some Throwables can also affect you too! 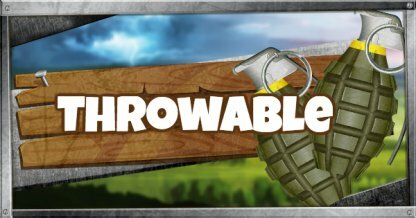 If you use a Throwable weapon, you will not be able to use it again, unless you pick another one up. Save your Throwable weapons for the right time! After using a Throwable weapon, it will fly in the shape of an arc before exploding at your target. Try throwing some around to improve your aim. By learning the different effects of each Throwable, you will be able to use them effectively for different situations. For example, you can use an Impulse Grenade as a quick escape from enemies! Familiarizing yourself with each Throwable's uses will allow you to manipulate groups of enemies! For example, a Stink Bomb can make a number of enemies leave their hiding spot so you can shoot them down! Boogie Bomb 0 Affected players will be forced to dance for 5 secs. Stink Bomb 5/0.5 sec. Inflicts damage over time to enemies within range for 9 seconds. Clinger 100 Throwable item that sticks to walls and cause a small explosion. Impulse Grenade 0 Impulse Grenades affects both allies and enemies as long as they are in the area of effect, knocking them back without dealing any damage. I love this website thank you so much.! !